Traveling east from Huntington towards Northport, about a mile past Park Avenue, a driver comes across Old Northport Road. Until it was changed when the current bank building was constructed a few years ago, the intersection was a true fork in the road. Continue on Route 25A, which curves to the left and you continue on a major artery passing a nursery, medical offices, and other commercial establishments. Turn right down Old Northport Road, you travel down a narrow, unlined, quiet, residential street. Judging by its name, the driver surmises that this was originally the road to Northport, which is, in fact, the case. It seems obvious that a State highway engineer in Albany decided that this old road to Northport should be by-passed and a new better road built. But why? Old Northport Road is perhaps straighter than Route 25A and the descent from west to east is less steep (as is the climb from east to west). It turns out the situation has nothing to do with Albany bureaucrats and everything to do with an early twentieth century wealthy landowner who wanted some privacy. But first a detour into the nineteenth century. Before the twentieth century, there were many fewer roads in Huntington. Roads were laid out to connect points A and B. The connection was direct, even if the roads did twist and turn to follow the topography. Outside of villages, roads were usually nameless. They were known for the two points on either end of the road. A look at a road map shows that tradition continues further east, e.g. Patchogue-Mt. Sinai Road, and Miller Place-Yaphank Road. Closer to home, there’s Syosset-Woodbury Road. Alternatively, people referred to where the road went, which depended, of course, on which end you start from. For example, what is now known as Greenlawn Road is known to old time Greenlawn residents as Huntington Road. 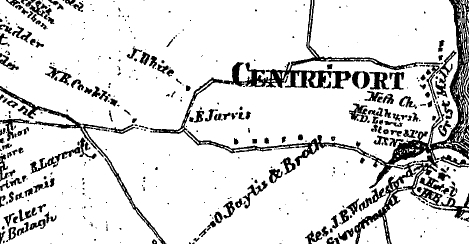 A section of the 1858 map of Huntington showing the road between Huntington and Northport, with a turn at the Jarvis house to the road to Centerport’s grist mill. Click on the map to see an enlargement. An 1858 map of Huntington shows a road leading from Huntington east to Centerport and then onto Northport (for the most part today’s 25A). If you wanted to travel to the grist mill in Centerport, which was located on the west side of the harbor at Mill Dam Road, you could turn left at the bottom of the hill east of the intersection with today’s Washington Drive. Perhaps because this route involved a climb up a steep hill, which was “very dangerous to travel,” a new road was built branching off of the road to Northport east of the fork with the road to Greenlawn (about where Woodruff Court is today). 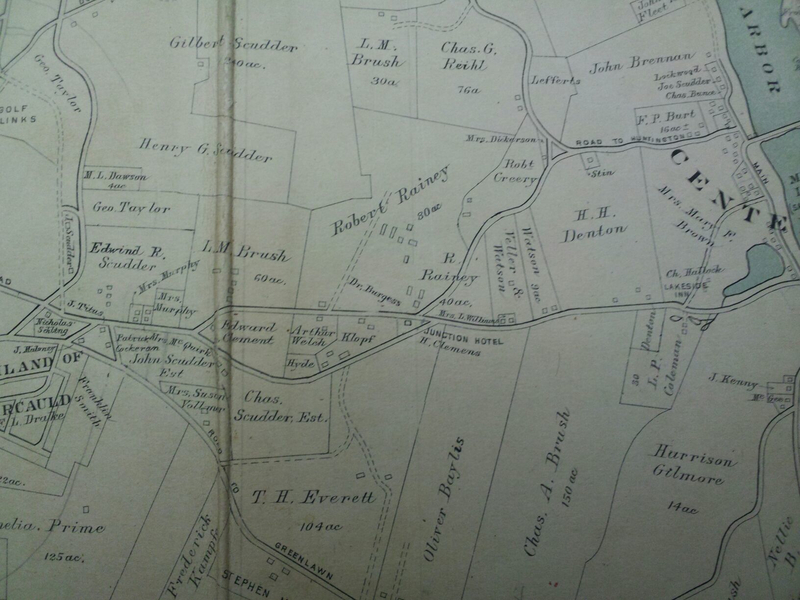 A section of the 1873 map of Huntington showing the new road to Centerport’s grist mill starting near the house of N.B. Conklin. Click on the map to see an enlargement. was made to build a new road between the upper road and the all-but-abandoned lower road. An eleven man jury met on December 15, 1883 at Merrill’s Hotel in Centerport to consider the proposal. Despite the fact that the new road would be straighter, shorter and less steep, the jury voted seven to four not to pursue the matter. Opposition focused on the expense of putting in a new road, even though several neighboring property owners promised to contribute funds for the endeavor. It was thought better to improve the old lower road. Fast forward to 1907. Roy A. Rainey, a millionaire sportsman from Cleveland, purchased Carmandale, the horse farm of Richard F. Carman—now the Crescent Club property. Mr. Rainey quickly set about to improve his new property. By 1908 hundreds of workers were busy remodeling the house and building a large addition. The stables, which were too close to the house, were demolished and new stables were built further away. Tennis courts were added (one grass, one clay). A sprinkler system installed. A new well was driven. In short, no expense was spared to create one of the finest estates on Long Island. There was one problem though. The road to the Centerport mill ran too close to Mr. Rainey’s new house. What’s a millionaire to do? Ask to have the road relocated, of course. In November 1908, Mr. Rainey asked the Town Board to consent to move the roadway several hundred feet to the south so that it would be the length of three football fields from his house. On November 23, a special joint meeting of the Town Board and the Town Highway Commissioners met Mr. Rainey’s superintendent to review the proposed changes. With some minor changes to civil engineer Frank Asbury’s map, the Town Board gave its consent to relocate the road just two days later. Mr. Rainey, of course, agreed to bear the expense of the change. The new road ran through the Jarvis farm, which Mr. Rainey purchased, passing between the Jarvis house and barn. 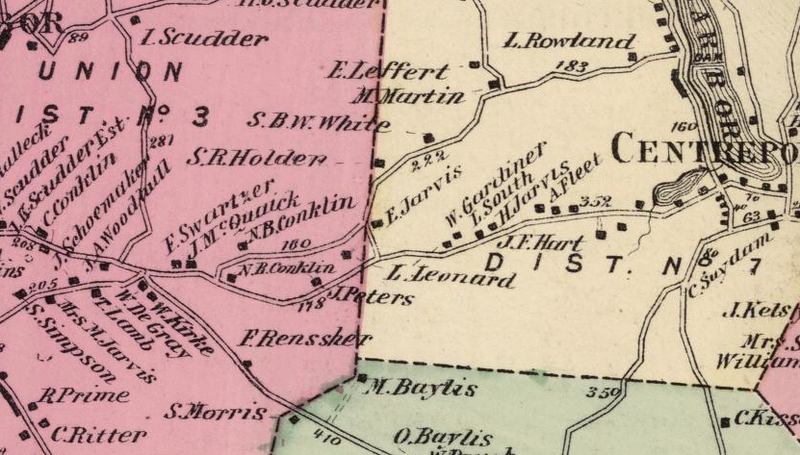 A section of the 1909 map ofHuntington showing the new road built by Roy Rainey. Click on the map to see an enlargement. The new route branched off from the road to Northport east of the turn for the road to the Centerport mill. It then curved gently to the northeast for a short distance, then took an easterly course to the top of the hill where it turned northeast again to connect with the road to the mill. A connection was built from the new road, down the hill, to meet up with the road to Northport. We know this today as the intersection of 25A and Washington Drive. The entrance to Mr. Rainey’s estate was at the southwest corner of his property. The allee of trees that flanked Mr. Rainey’s driveway still stands and can be seen just west of the medical building at 205 East Main Street. The new road was naturally the preferred route. The old road to the south is identified on the 1941 Hagstrom street map as Lower Huntington Northport Road (who wants to take the low road?). On the official 1946 Town Highway Map, it is identified by its current name, Old Northport Road. Mr. Rainey’s 1908 road is, of course, now part of New York State Route 25A and has been since the State got involved with roads. Route 25A never included Old Northport Road. Historically, road building was a purely local concern. Town government was responsible for laying out, maintaining and repairing roads. This patchwork approach proved unsatisfactory by the end of the nineteenth century when bicycling was becoming ever more popular. Bicyclist—or wheelmen, as they were called—started agitating for better roadways. Their efforts were finally successful in 1898 when New York enacted the Good Roads Bill, also known as the “League of American Wheelmen Bill.” Under the new law, the State would assume 50% of the expense of road construction, the County was responsible for 35% and the Town for the remaining 15%. In addition to improving things for bicyclists, better roads benefitted farmers who could now get their produce to market more easily. Suffolk County was quickly urged to seek its fair share of State funds. But it was not until the State raised $50 million through a bond issue in 1905 that large scale funding was available. An additional $50 million was raised seven years later. In Huntington State funding helped improve the Town’s two major east west thoroughfares (Jericho Turnpike and the then nameless northern road that is now known as 25A) and two roads to local train stations (Harbor Road connecting Cold Spring Harbor village with its train station, and New York Avenue). At first dirt roads were improved by spreading gravel. When gravel proved too difficult to maintain, macadam was used. Macadam is a construction method rather than a material. Developed by John Loudon McAdam in 1820, the method called for using small stones, all of the same size over a slightly convex surface. Starting in the early twentieth century tar was used to coat the stones both to act as a binding agent and to keep dust down. A surface so treated is tarmac, short for tar-bound macadam. In the second decade of the twentieth century, concrete was used to form a long lasting durable road surface. Asphalt was introduced in the 1920s. What does any of that have to do with Old Northport Road? When Huntington began to concrete 25A in 1920, the work started in Cold Spring Harbor and went as far as Rainey’s gate. Later the work was continued from Rainey’s gate to Northport and on to King’s Park. In other words, the improvements made on 25A were made on Mr. Rainey’s new road, not on the old road to Northport. Therefore, from the very beginning, Route 25A incorporated the road Mr. Rainey built and not the historic road to Northport. This explanation may have been as winding as an old country lane. But I hope we have reached our destination: an understanding of why one segment of what had been the main route between Huntington and Northport is now the road less traveled by. Thanks for another interesting article. The medical building you mention (205 E. Main Street) is where my doctor’s office is located so when I have my January appointment I’ll look for the allee of trees. My grandparents, Forrest and Grace Ragle (Grace was Huntington’s town tax collector, Fusion Party), bought the farm across 25A from the Cresent Club, We sledded in the winter at the Cresent club. This property, was bought in the 40’s and where I grew up in the 50’s-70’s. Our driveway opened onto the intersection of 25A and Washington Drive ( before the shopping center ). Old Northport Road, was the other boundary of our family’s farm.. Many memories of running from one end to the other to our bus stop on Old Northport Rd. Many car crashes on that intersection 25A and Washington Drive, before the light was installed. My parents sold the property in early 2001, which I believe stands undeveloped. The original farm house (grandparents)was destroyed in a fire about 1961, and we continued to live in the renovated original barn. There were stalls in the basement for cows. I so enjoyed your article..